WHY DO YOU WANT TO GET BAPTIZED? WHAT IS THE REASON? 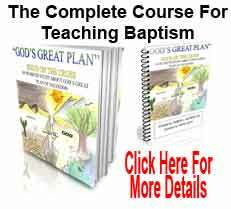 You’ll be amazed at how “God’s Great Plan” captures students’ attention and teaches them everything they need to know about baptism in just 8 sessions. [Continue Reading] to find out more about this course and how it can impact your students.